By introducing a series of 5 predictive people management processes, HR and people management shifts from a reactive to proactive function. The benefits of a proactive function are numerous, but in essence, they enable HR to provide foresight into decision making and process optimisation, along with raising effectiveness and business performance. Human resources and people management has always been a reactive, rather than proactive function. By way of contrast, almost all other business functions have the ability to successfully predict and forecast outcomes. For example, manufacturing defects, traffic flows, project costs, company cash flows and even the flu are all predictable to one degree or another. That said, the inability to successfully predict people centric outcomes is best expressed through the following research. 10 - 40% of performance is determined by the quality of people's relationships. See the following research from Harvard, MIT, Warwick/Proudfoot (pdf) and Amsterdam/Carnegie Mellon (pdf). And yet there are no tools that allow relationships to be predicted and forecast. Between 2001 and 2012 employee engagement in the US and Germany has barely moved, there's just been a 4% fluctuation (According to Gallup, in the US figures range between 26% - 30% whilst in Germany, figures vary from 11% - 15%). Taken as a whole, the past 10 years worth of work hasn't created a material improvement in engagement levels. From the research data above, it’s clear that organisation’s are failing to tap the full potential of their people and in turn miss out on double digit performance gains. By extension, the various methods, tools and systems designed to raise engagement have failed to have a material impact. Given that various research reports that engagement has a double digit impact on earnings growth, operating income and profitability amongst others (see research data on the impact of engagement on performance from Towers Watson, Academy of Management and Gallup. ), it’s clear that businesses are failing to tap into significant drivers of performance. The solution for this hack comes from the ability to predict people’s behaviours, relationships and shared values. Take a look at diagram 1. By using 4G and Social Relationships, it is possible to predict, in advance of people meeting each other, the type and nature of the relationship between any two people. Diagram 1 illustrates 3 relationships from a possible 15. 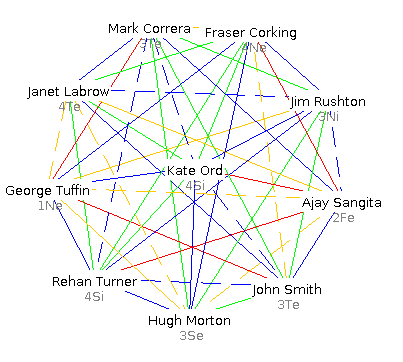 Whilst diagram 1 showed just 3 relationships between pairs of people, diagram 2 extends this concept to show all 15 relationships amongst the group of 6. As before, the colours offer a visual overview of the team dynamics, whilst highlighting the comparative complexity in the group. Whilst diagrams 1 and 2 show a visual representation of team relationships via the coloured lines, diagrams 3 and 4 offer text based information, creating an in-depth understanding of the group in question. It should also be noted at this point that while only 4 colours are used in the diagrams, 4G contains 14 specific Social Relationships and 16 different Social Profiles. 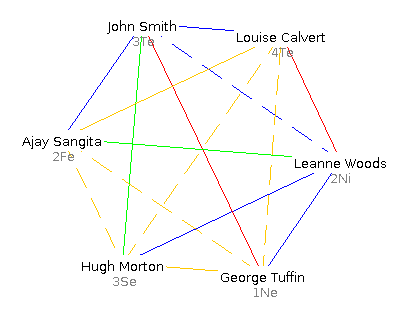 As a result of this greater granularity, diagram 3 offers a bullet point summary of Hugh Morton's Social Profile (3Se), whilst diagram 4 shows much more detailed information about the relationship between Ajay and Leanne (a Relationship of Reflection). Much more detailed information about people's Social Profile, and the nature of each of the Social Relationships and related coaching and developmental recommendations are also available from 4G. Social Groups define group values or 'cultures' that are found between Social Profiles who share the same number. 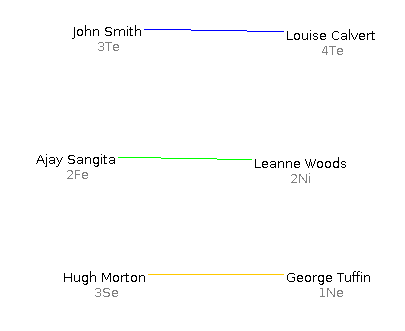 For example, a team comprising of a 1Fe, 1Si and 1Ti would all be from Social Group 1, whilst a team of people whose profiles were 3Ni, 3Se and 3Te would be from Social Group 3. When individuals are part of the same Social Group, they come together to share common group values, enabling the group to work together more cohesively. By extension, performance is likely to be above average. 4G also identifies which value system the Social Group will have an affinity with in terms of values, working environment, group pioneers, early adopters and change sceptics, as can be seen in the table below. An explanation and examples of each process follows. Training and development activities typically comprise of discreet, best of breed approaches. Each approach is tailored to a particular topic such as leadership or communication skills but these topics are often unrelated to each other, creating developmental silos and making it hard to transfer learning from one situation to another. To combat these inefficiencies and silos, 4G uses a common theoretical foundation for all of it's training and development materials, coaching modules and accreditation resources. Given that training in Social Profiles, Social Relationships and Social Groups introduces new ideas, along with being applicable to all of the other 4G business processes outlined below means that each new learning activity builds on the previous, simultaneously creating economies of learning and economies of scale. More broadly, there is the possibility to create a 4G learning and development syllabus with multiple levels of expertise and experience accounted for, similar to the professional qualifications offered by Six Sigma or Microsoft for example. This then creates a widely applicable and transferable skill to multiple constituents within an organisation e.g. subject matter experts, trainers, departmental heads, line managers, 'top talent' and new managers etc. In applying the principles of predicting relationships, it's possible to enhance existing recruitment and selection processes. By including a predictive measure of candidate-person fit, person-person fit or person-manager fit, depending on the context, an additional and previously unavailable data point can be added to the decision making process. Diagram 5 shows this in practice. By comparing the level of fit between Candidate One on the left and Candidate Two on the right, it's clear that given the 4 green lines, Candidate Two offers the best relationships, both for themselves and the 4 other team members. Of course, this doesn't include information on people's skills, experience, how they come across at interview and other relevant factors, all of which need to be factored into a hiring decision. Diagram 6 offers another example of using 4G in recruitment. 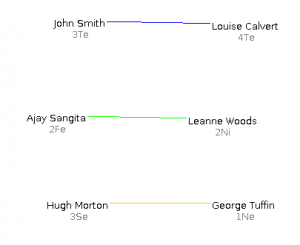 In this case, the data from 4G makes Candidate Three a better fit than Candidate Four. It should be noted that while the 4G data is shown visually, it is also possible to quantify this information and analyse it numerically via Relationship Friction. 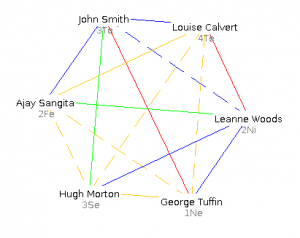 Relationship Friction offers a precise quantification of the different Social Relationships, aiding decision making when the diagrams aren't sufficient. The use of 4G for recruitment is similar to team creation. The processes are comparable, as is the application of 4G. Diagram 7 shows 3 teams each with 4 people. The breakdown of Social Relationships is random in this example and as a result, there is a reasonably even spread of green, blue, yellow and red relationships. This is typical of the majority of teams encountered in organisations, not least due to the often ad-hoc nature of recruitment and team creation. By using 4G as one of the inputs into team creation, it is possible to optimise and enhance the relationships in the team, along with improving performance and engagement. 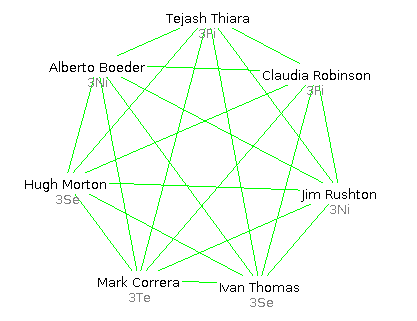 Diagram 8 shows the same 12 people but their team membership has incorporated elements from 4G and the corresponding improvement in relationships is clearly visible. Empirical research into 4G validates the fact that the 14 Social Relationships can be ordered from most to least productive. By combining this rank order of Social Relationships and linking the corresponding ratios to people's salary, it is possible to calculate the financial cost of relationships and to return quantifiable and objective measures of team performance, effectiveness and efficiency. These calculations then offer HR a formula to link the results of various business processes (e.g. team creation, restructuring, training and development outcomes, recruitment, business development, customer service etc.) to KPI's and other quantifiable measures of performance (e.g. sales, staff engagement, group or individual performance data, the time and costs of specific objectives being achieved, task completion etc.). In addition, the use of Social Relationships provides an objective and qualitative input to complement the quantitative. 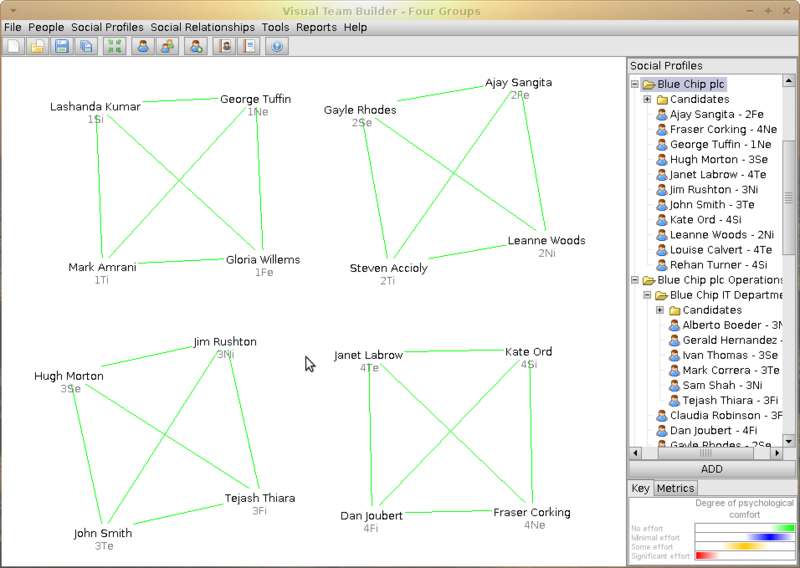 In diagram 9 and the table below, a random team of 7 is analysed using Relationship Friction. Everyone in the team is paid £50,000, making the total salary for the team £350,000. Given the 7 Social Profiles and the breakdown of the 21 Social Relationships, the cost of Relationship Friction for this team is £60,195 or 17.2% of the total team salary. In addition, the Relationship Friction Index is 864, allowing Relationship Friction data to be compared across different teams without revealing sensitive salary data. This example of Relationship Friction shows how simple it is to present the results and how straightforward it is to understand. The second example allows a comparison with the first and allows a 'before' and 'after' scenario to be shown. In this instance, the comparison might be between two different customer service teams, but could equally compare two teams of accountants or two sales teams. 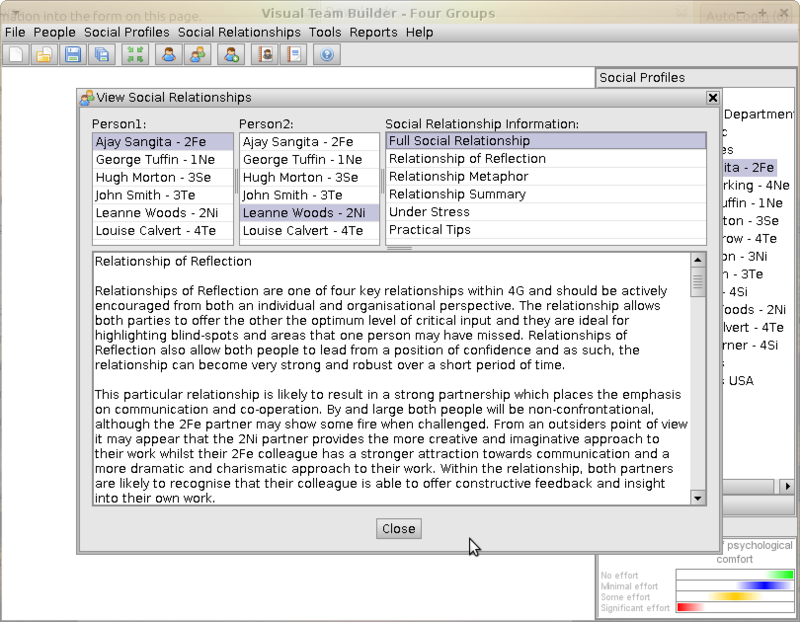 The second table and diagram 10 show the change in Relationship Friction if the team of 7 is optimised around a particular Social Group, in this case, Social Group 3. By creating a team in which everyone is a member of the same Social Group, not only does everyone experience optimal Social Relationships, but the Relationship Friction figures improve dramatically. In this case, Relationship Friction falls to £18,357 or 5.2% of the team’s combined salary. This is a difference in Relationship Friction of £41,838, or a fall of 12%. Likewise, the Relationship Friction index falls to 264. While the examples above help illustrate the changes in the 'before' and 'after' scenarios, not every use of Relationship Friction requires the use of a team creation process. 4G makes it possible to identify people who, in principle, are much more likely than average to pioneer change and adopt new methods and approaches ahead of others. Of the 16 Social Profiles, 4 are considered 'pioneers' and 4 are 'early adopters'. For the sake of definitions, pioneers are the idea generators, while early adopters are often the first to try out a new idea and to put change into practice. 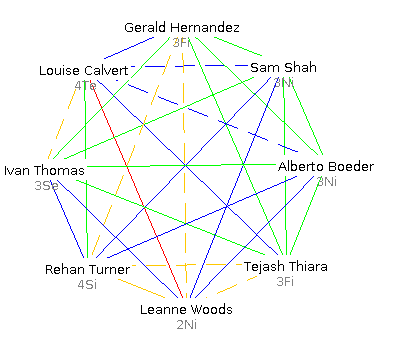 In diagram 11, Leanne (2Ni), Alberto (3Ni) and Sam (3Ni) are all pioneers, while Gerald (3Fi), Tejash (3Fi) and Louise (4Te) may be more sceptical of any proposed change. Knowing if a particular person is a 'pioneer', 'early adopter' or 'sceptic' is itself insufficient to create an army of change agents. While possible candidates can be easily identified, contextual and organisational information must also be considered if people are to 'sign up', 'be recruited', or 'conscripted', as the case may be. Knowing someone's propensity for new ideas and change in isolation is one thing but in order for this to be useful, the context of any change needs to be factored into the equation. Part of the context consists of classic change management considerations such as the change itself, the business case, the individual’s own career and personal objectives, how long the change will last, how much it costs, what elements of value might be lost as a result of the change and so forth. All important and fundamental. The other part of the context consists of analysing the culture and values related to the change. From a 4G perspective, Social Groups define shared values and group cultures. 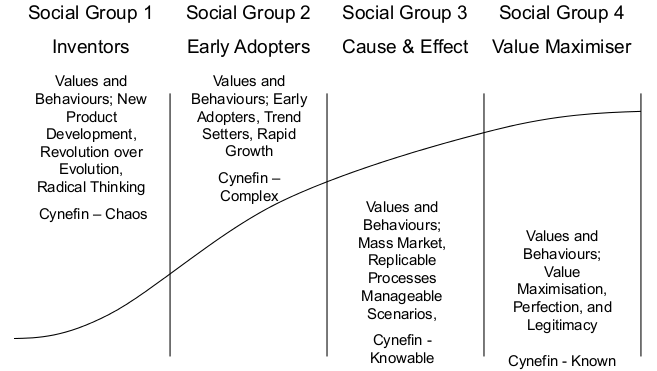 Diagram 12 offers an introduction to each of the 4 different Social Groups, along with providing a proxy for the Cynefin model. Social Groups are important for two reasons. Firstly, they define ideal or optimal teams of 4 people who each share a Relationship of Action (motivation and energy), Balance (boosting strengths and minimising weaknesses) and Reflection (feedback and critical thinking). Each of the 4 groups of 4 sharing these relationships can be seen in diagram 13. 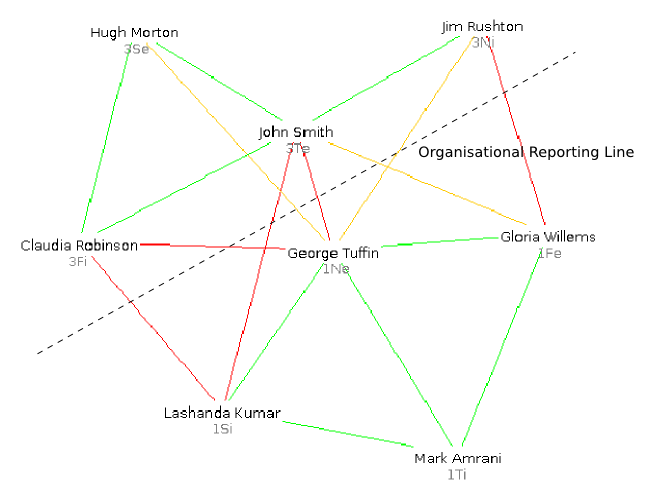 By linking specific Social Profiles to Social Groups and triangulating this with an organisation's commercial and operating context, it's possible to gain deep insights into change processes and to identify people who are best placed to influence, lead or faciliate change in a given situation. In addition, this approach to change has the added advantage of working in both top-down and bottom-up environments. Social Group 3 is at it's best in environments where cause and effect relationships are apparent, change is commercially justified and making a practical difference is a priority. Likewise, structure and processes are important, along with targets, data, plans and a tactful and diplomatic working style. Contrast this with Social Group 1 who excel in environments with limited or even no structure where originality, spontaneity, passion and experimentation are important. 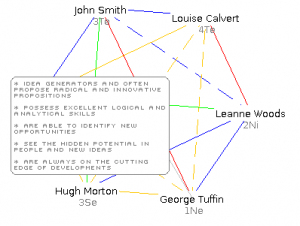 Equally, radical propositions and blue sky thinking are also highly valued by Social Group 1. Given these contrasts and their implications for culture, change and prioritisation, the information in diagram 14 should come as no surprise. 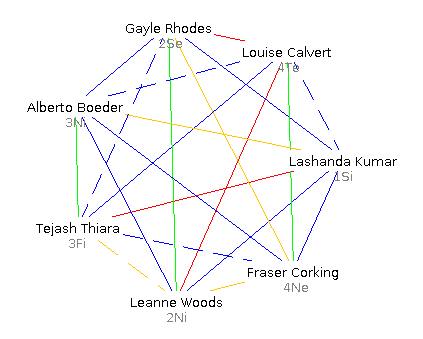 Diagram 14 shows how everyone in Social Group 3 shares green relationships, but that yellow and red lines are drawn between the people in Social Group 3 and 1. When it comes to change, it's easy to see how a top down approach from the leadership team in Social Group 3 may well create delays, resistance or scepticism from the team in Social Group 1. The example in diagram 14 shows how top down change can often come unstuck as a result of cultural or relational factors. Culture and relationships are also good substitutes for some of the key barriers to change; commitment, passion, drive, involvement, vision, leadership and communication. In this instance the combination of Social Profiles, Social Relationships and Social Groups create a common denominator for barriers to change above. While diagram 14 illustrates how top down change initiatives can struggle when faced with contrasting cultures and challenging relationships, diagrams 15 and 16 show how these problems can be overcome. 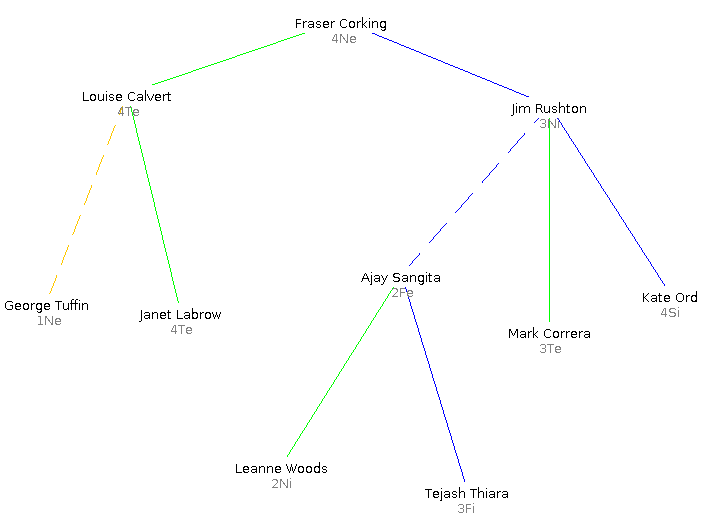 In diagram 15, Fraser is attempting to change the way that Ajay works. Both are highly skilled and experienced but given the difficult relationship between them, Fraser's efforts are proving frustrating. In addition, Ajay finds the conflict very stressful and begins to fear that his anticipated promotion is going unlikely to happen as a result. 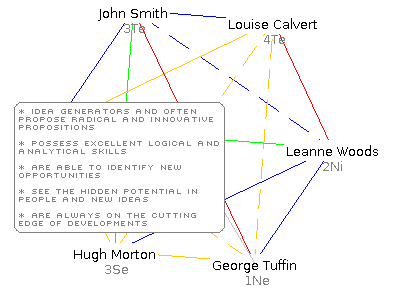 As 4G predicts the outcome of relationships in advance of people meeting or working together, Fraser knows that Jim will be a great intermediary, as shown in diagram 16. Jim's blue relationships with Fraser and Ajay make for much easier communications and by stepping in, both Fraser and Ajay save time and don't continue to struggle with what was a very difficult issue. It's also worth noting that the change proposed in diagram 16 can be implemented formally or informally and can be seen either as a short term intervention lasting a few weeks to a couple of months, or may last for 6 months or more, depending on the situation. Finally, while Fraser, Jim and Ajay are all either 'pioneers' or 'early adopters', the Social Relationships that they share will be more important in this instance than their own Social Profiles. 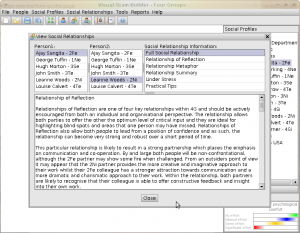 Diagram 17 shows a group of 10 people who together share 45 Social Relationships. When it comes to empowering bottom up change and creating an 'army of change agents', giving people access to 4G data is one way to facilitate this. 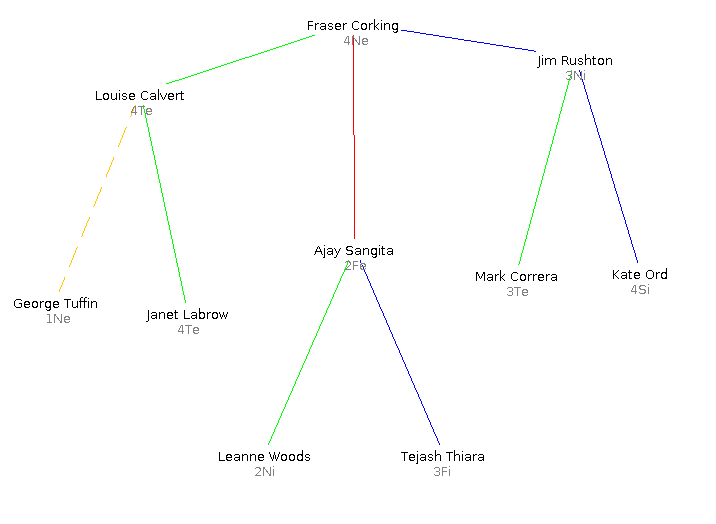 Given the complexity within the team of 10 (e.g. there are 252 different ways to create a team of 5), knowing how everyone's relationships unfold makes a huge difference in terms of enabling change and improving communication. By giving individuals access to the information from 4G and incorporating the concepts from Hack HR 1, it's possible to empower individuals with unique information that can directly impact their approach to instigating and managing change. In addition, because 4G can be used in a scalable and consistent manner, the tool is able to support top down and bottom up initiatives in equal measure. Predicting relationships and group dynamics can challenge some people’s assumptions about what is possible in HR and people management. Some may not think such a thing can be done while others will believe that they can ‘already do this’ and have no need for a new approach. As above, there is no ‘solution’ to such scepticism, other than to find people interested enough to explore further. More broadly, the predictive elements of the processes may challenge office politics and vested interests. People who have built relationships through political means, or whose career progression has required the investment of political capital may find elements of these hacks a threat to their career or current status. Given the nature of organisational life, this is expected and is perfectly understandable. In addition, these scenarios are typically concentrated towards the top of organisation where power and political capital are concentrated. Given this scenario and that is it likely to be found in virtually all organisations, it is prudent to begin experimenting with the different hacks in areas of the business that are lower down the hierarchy, where political capital is in short supply and where the levels of sponsorship from senior people are abundant. In general, the first step to applying any of the processes above would be through a combination of gathering suitable sponsorship and exploring the relevance and applicability of each process through workshops and action research. The outcome of such an approach would be to find a pilot site within an organisation who wanted to begin experimenting with the new process(es) with a view to building a business case and establishing operational feasibility. a. Can be started in 30 days and yield initial results in 90 days? Yes. Creating High Performing teams can be implemented very quickly, particularly in areas where lots of people with similar skills are doing the same work. Examples might include call centres, shift work, retail environments, customer service and so forth. b. Relies on volunteers rather than conscripts? Yes, it’s likely that senior executives would volunteer their sponsorship, although what this means for people lower down the hierarchy and if they are regarded as ‘conscripts’ or not is subject to each organisation’s own culture. This is case by case. c. Doesn’t require multiple levels of approvals? As item b, this depends on the organisation and is case by case. d. Is feasible within existing budget constraints? Case by case, but it wouldn’t be prudent to make budget a barrier to pilots, creating business cases and experimentation with the hack. Thanks to Mike Orchard and everyone on the Hackathon site for sharing comments, feedback and ideas.